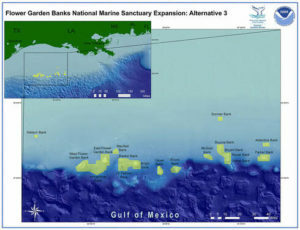 The Flower Garden Banks National Marine Sanctuary (FGBNMS) is comprised of stunning and unique shelf-edge coral reef habitats in the northwest Gulf of Mexico (GOM). Our collaborative research approach in this region combines habitat characterization, population genetics, biophysical modeling, and molecular ecology to understand ecosystem functions and enhance management strategies. Complementary methods include SCUBA, technical diving, fish acoustics sonar, and remotely operated vehicles (ROVs) to survey benthic and fish communities, collect biological samples, and deploy oceanographic equipment. This project builds into our larger Mesophotic Coral Reef initiative and deep coral exploration through the Cooperative Institute for Ocean Exploration, Research, and Technology (CIOERT). Our outreach efforts related to this research include public presentations, project videos, still images, and participation in telepresence-enabled ROV cruises at FGBNMS bringing the excitement of mesophotic exploration in the northwest GOM to streaming devices worldwide. Of the dozens of banks along the continental shelf margin, three are currently protected within Flower Garden Banks National Marine Sanctuary (West FGB, East FGB, and Stetson Bank). Some of the other mesophotic banks to the east of FGBNMS are protected from fishing and offshore oil activities (Bright, Geyer, and McGrail Banks) as Coral Habitat Areas of Particular Concern (CHAPCs). A proposal by the FGBNMS Sanctuary Advisory Council would expand the NMS boundaries to include 15 additional mesophotic banks. Using microsatellite markers from the dominant coral species Montastraea cavernosa, we determined how coral populations across the GOM interact with populations in FGBNMS and nearby mesophotic banks. In combination with a biophysical model estimating larval migration within the northwest GOM, we identified that some of the banks considered for sanctuary expansion likely contribute to the FGBNMS population. We are expanding our connectivity analyses across the northwest GOM to additional species including corals, sponges, and fish using single nucleotide polymorphism (SNP) population genetics markers. How do shallow and mesophotic corals adapt to their different environments? Light limitation at mesophotic depths results in morphological, physiological, and symbiotic shifts and may influence population dynamics across depth ranges and broad spatial scales. Mesophotic corals in the NW GOM demonstrate photoadaptive strategies relative to their shallow counterparts, including smaller skeletal structures and increased symbiont densities. More detailed assessment of corals' responses to changing environments can be accomplished through differential gene expression studies. Using a tag-based RNA-Seq pipeline, we have sequenced Montastraea cavernosa transcriptomes from sites throughout the GOM, including Belize, Flower Garden Banks, Pulley Ridge, and Dry Tortugas. Additionally, our transplant experiments at West and East Flower Garden Banks where colonies were moved from mesophotic to shallow depth zones have identified lower bleaching thresholds in mesophotic corals and a "core set" of genes whose differential expression may influence photoadaptation at depth.